No, you didn't misread the ingredient list. There really is no bourbon in this bourbon chicken recipe. 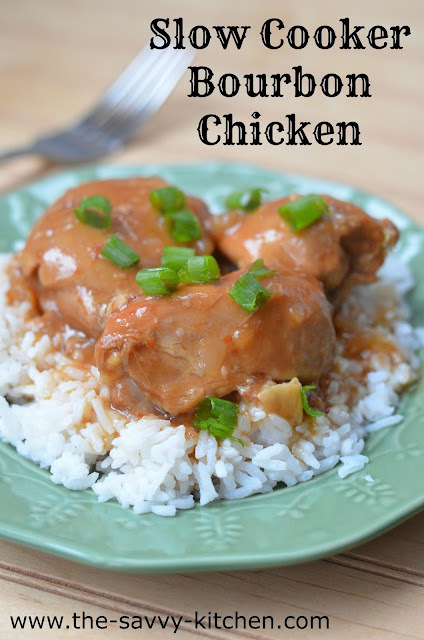 I chose to exclude it because honestly…I don't love the taste, and most of the other "Bourbon Chicken" recipes I looked at didn't contain bourbon in them either. So weird. But whatever you want to call this chicken, it's just plain delicious. 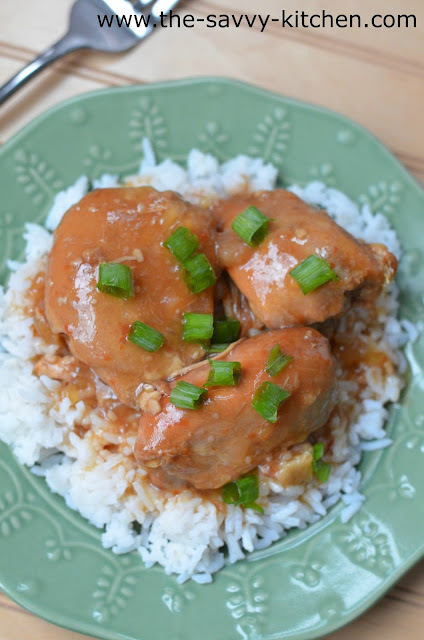 Chicken thighs get so tender, especially when slow cooked, and the combination sweet/savory sauce is amazing. Enjoy! Place the chicken in a slow cooker. In a small bowl, mix the ginger, garlic, red pepper flakes, apple juice, honey, brown sugar, ketchup, vinegar, water and soy sauce. Pour sauce over chicken. Cover and cook on LOW 6-7 hours or on HIGH 3 hours. When done, remove chicken from the crockpot. If desired, cut into bite-size pieces or you can keep them whole. Meanwhile, put the cornstarch in a small bowl. Remove about 1/4 cup of liquid from the slow cooker and add it to the cornstarch. Stir very well. Pour the cornstarch slurry into the remaining liquid in the crockpot and stir to combine. Add the chicken back into the crockpot and stir to combine.